High resolution image of the CVC complex. The membrane along the collecting canal of ruptured cells shows that the excess smooth spongiome membrane forms a three-dimensional array similar to etiolated chloroplasts when a piece of wood stays on a grass lawn too long preventing photosynthesis from occurring due to the lack of sunlight. Sometimes this configuration of membranes is referred to as cubic membranes (Landh, FEBS Lett. 369:15-17, 1995). 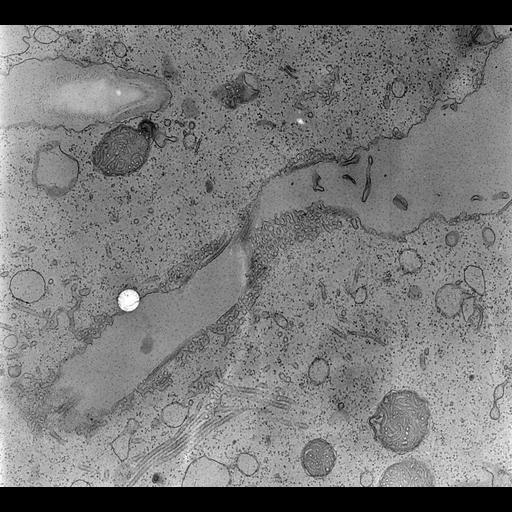 TEM taken on 8/8/96 by R. Allen with Zeiss 10A operating at 80kV. Neg. 12,000X. Adapted with permission from the J. Cell Sci. 112:3733-3745, 1999.The raw film was scanned with an Epson Perfection V750 Pro. This image is best used for quantitative analysis. Standard glutaraldehyde fixation followed by osmium tetroxide, dehydrated in alcohol and embedded in an epoxy resin. Microtome sections prepared at approximately 75nm thickness. Additional information available at (http://www5.pbrc.hawaii.edu/allen/).